Last night a strong thunderstorm rolled through our neighborhood, accompanied by lots of lightning, heavy rain ... and hail. Earlier in the day it rained for the first time in almost three weeks. The rain was much needed, with some of my flower beds having dried out so much that the dirt was dusty when I tried to weed. 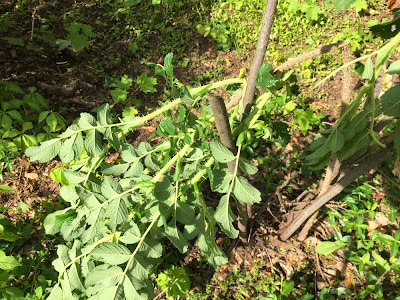 It seems cruel that the first major storm of the spring growing season would assault the plants as well. 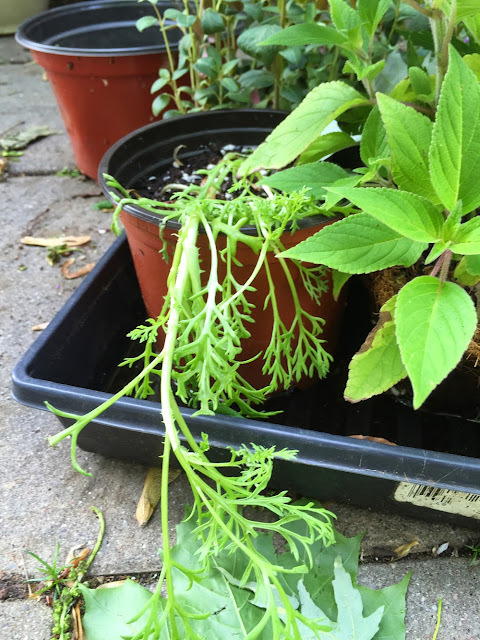 Annual flowers I had grown from seed that were spending some of their first few nights outdoors unprotected on the patio were also struck down. I'm not sure how many will bounce back. Trays of plants were flooded, with snapdragons released from their newspaper pots and swimming instead. As a gardener, it's important to keep an eye on the weather, a unfortunate reminder this morning when I realized I had not done that. While I couldn't have prevented most of the damage, I could have moved many potted plants indoors. Annual chrysanthemums were no match for the hail. 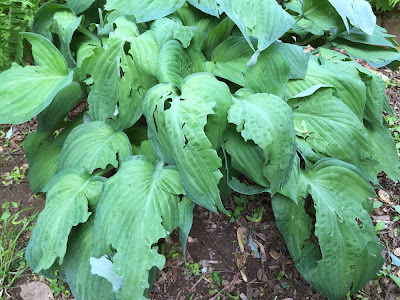 The worst victim of all: This hosta that's been in the family since 1996. Luckily, the new greenhouse remained intact and in the ground. It is anchored with many bricks and anchors inside. The trash cans I store bird food in are used as a support on one side, as well. At least inside the greenhouse, the imagery was nicer. 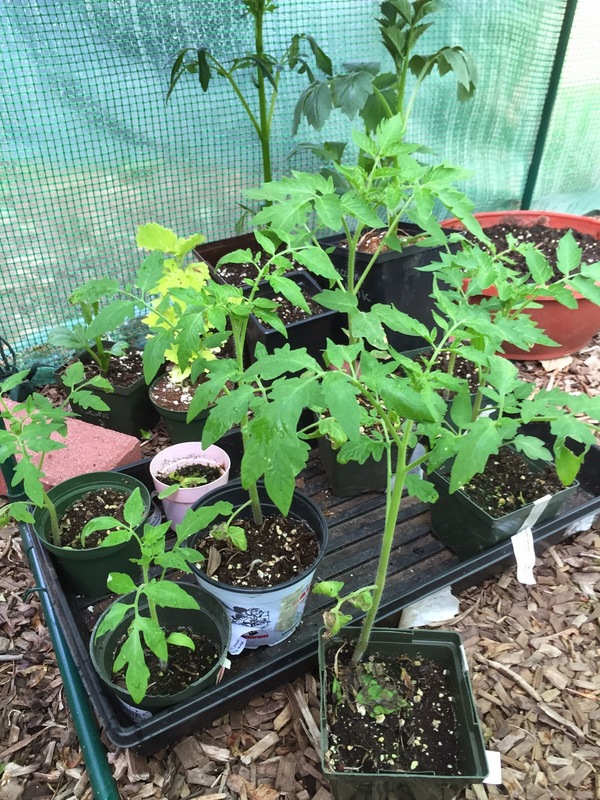 Tomatoes protected inside the greenhouse. 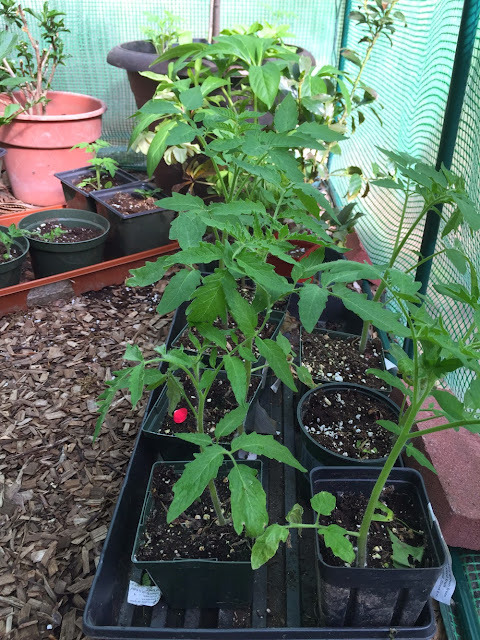 More tomatoes protected inside the greenhouse. 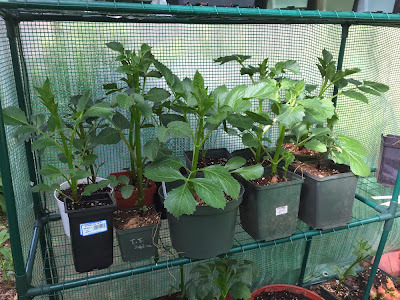 Dahlias waiting to be transferred outside. How has weather wrecked havoc on your garden? 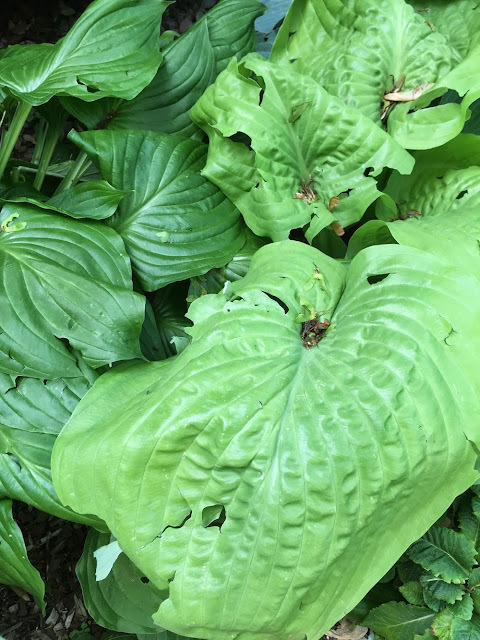 I am participating in the Garden Tour 2015 hosted by Beth at More Than Oregano. Click on the green text that says, "You are next" at the bottom of this page. Then follow the directions to link-up your post and share it with the rest of us. If you would like to show the entries on your own blog, after you've linked up click "Get the code" and follow the directions. Jen ~ Thank you for sharing your garden in it's very real state. We've all been there when the storm hits! Ugh! So glad you have green house reserves...can't wait to see how you rebound and get the garden growing again. I know you will! Oh Jen so sorry about the damage this storm caused :( At least your green house kept your tomatoes protected. Please keep me updated, crossing my fingers most plants can make a full and speedy recovery! How devastating. I hate when I have slug holes in my hostas, so I'm sure you are upset. Hopefully all your damaged plants recover in record time!